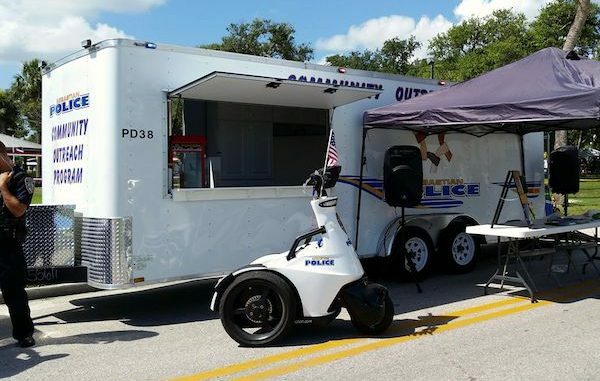 SEBASTIAN – The Sebastian Police Department will host the Grand Opening of the Community Outreach Program platform today to feature their new COPs Mobile PD at the Barber Street Park from 4 p.m. to 7 p.m. The event will be at the west parking lot near the basketball courts at the intersection of Albatross and Fairfield Drive. Community policing has been the long-standing, organizational-wide philosophy utilized by the Sebastian Police Department promoting partnerships with both businesses and the community. For over a decade they have realized the benefits of an extremely low crime rates and increasing crime clearances through proactive problem-solving and community engagement. According to the Sebastian Police Department, it started at the top with the Chief of Police and Command Staff “leading from the front” and personally participating in the effort to focus employees on positive interactions to hiring the right people with the right mindset. While the entire civilian and sworn staff lives the concept of community policing in their everyday tasks, the C.O.P.E. Unit is the department’s “tip of the spear” dedicated to organizing and coordinating this vital function across the agency. The mission of the C.O.P.E. Unit is to be the catalyst in forming partnerships that bind the community and the Sebastian Police Department together with common cause. The Unit’s effort focuses on developing and employing proactive crime prevention strategies with community education and involvement, in addition to forming alliances with both residential and business partners. To engage the community, they conduct the standard fare of attending homeowners meetings, creating neighborhood watches and networking with community organizations, but one unique aspect was to launch the Community Outreach Program traveling trailer. Simply put, this is the mechanism that makes it easy for the agency to hook-up, pull out and relocate the police department out in a neighborhood or at a special event within City. citizens face-to- face in one-on- one encounters. Officers, Detectives, Command Staff and other members of the agency, such as the Volunteers, Crime Scene Technician, and Dispatchers, set up in various neighborhoods within the city to participate in this outreach. They provide an attraction and utilize food, giveaways, and activities such as popcorn, snow cones, pizza, pamphlets, footballs, basketballs, etc., based on the constituency of the particular event or location. a weekday evening for a few hours and uniformed officers played basketball with the more than 25 regular teenagers that routinely play there. sit in the police car and have their picture taken. At the City’s 4th of July day long event, they handed out hundreds of pamphlets, answered questions about citizens’ concerns, and provided giveaways in the form of t-shirts, pencils, etc. to the kids and adults alike. These events provide an opportunity to inform the public, distribute crime prevention materials, and build relationships with neighborhood kids, parents, retirees and business partners about the quality of life issues and often correct misconceptions about the police, procedures or crime activity in the City. The goal of this program is to create a lasting environment of cooperation between the police, the citizens, and businesses of Sebastian. Hope to see you there today at the Grand Opening of the Community Outreach Program platform at the Barber Street Park from 4 p.m. to 7 p.m.